Comes in handy and helpful in emergency on camping, trips, beaches and parks where conventional electricity is not available. 1 AC outlet and dual USB ports can meet your multi charging requirements. From connector to connector the cord is 28" long. The plug into the car cigarette lighter socket is about another 2". 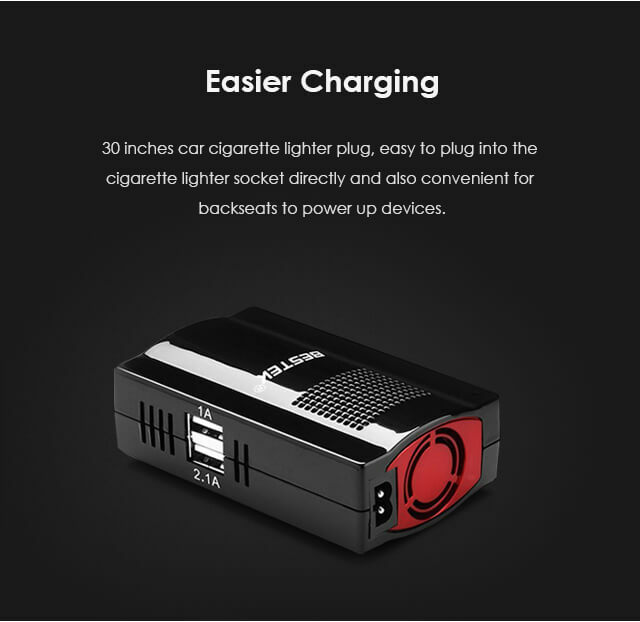 Is this good for just plugging into cig lighter so that I can keep from using up laptop battery on long trips? I traveled five thousand miles in a week. Girlfriend did homework on her laptop with this charger the whole time. It's all good. Yes,it has an internal fan that you can only hear what it is warming up. Can I power a small speaker system takes only 50 watts? 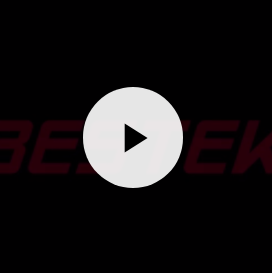 BESTEK 150W Power Inverter can provide 150 watts continuous DC to AC power, so 50 watts is available. Does it come with clamps, or just the cigarette adapter? No. It does not come with clamps. Does this work as a portable charger? 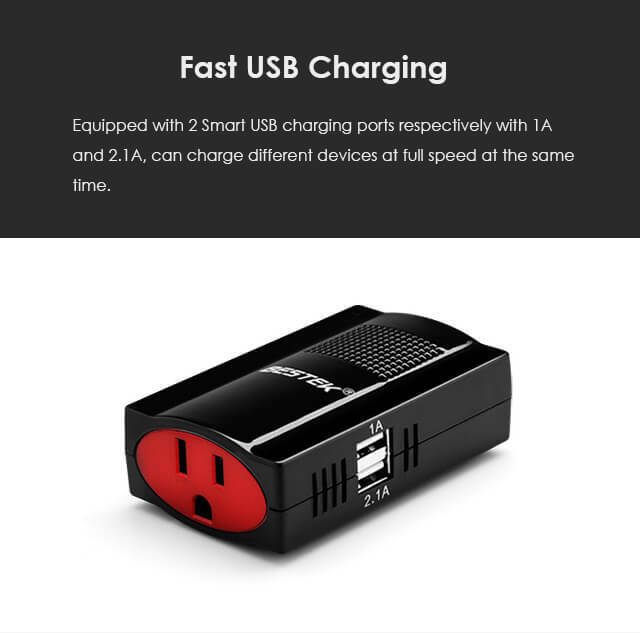 This is a power inverter, it can convert DC 12V power to AC 110V power for you, ideal for charging your laptop, TV, cell phones, battery chargers, portable DVD players, mobile phones in the car. What about smartphones ? 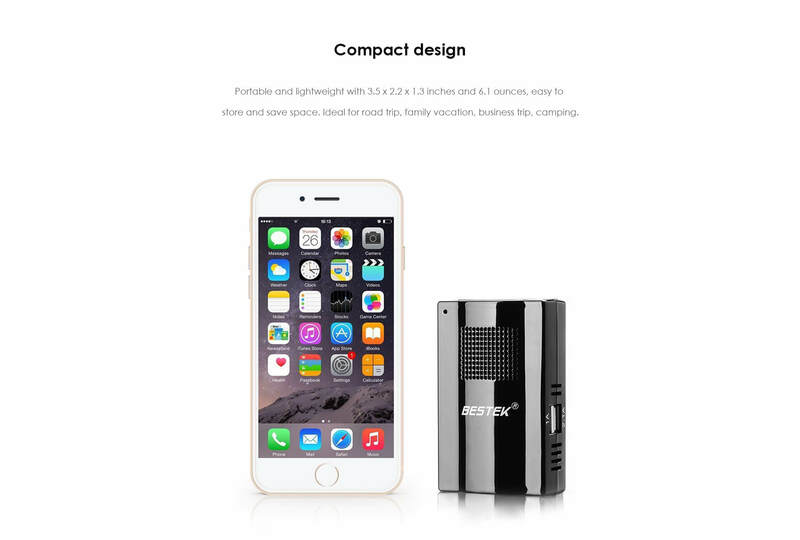 Is this too much watts or should I get a smaller watt like 75 watts if all I need to charge is a smartphone and a bluetooth??? Is this safe to use with a hybrid vehicle ? Yes. Your 12 volt power outlet on your car is fused. If something goes wrong, the fuse will blow as intended. It worked great for me. I used it to run a portable dvd player from Michigan to Florida and back. We used it for more than 15 hours with no issues. Very solid. Good fan. Heavy duty cord. Works easily and consistently. I recommend. Simple designed but great in performance. 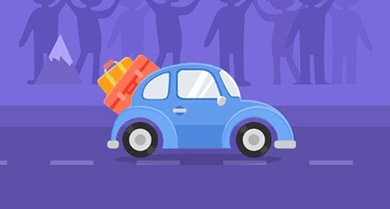 It is so handy that you can take it out for trip anytime you want. 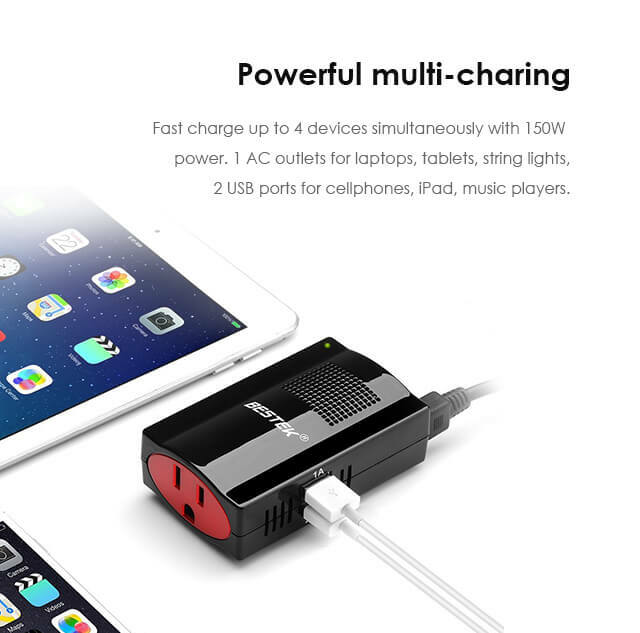 You can use it to charge cellphones, ipad and other devices at the same time. 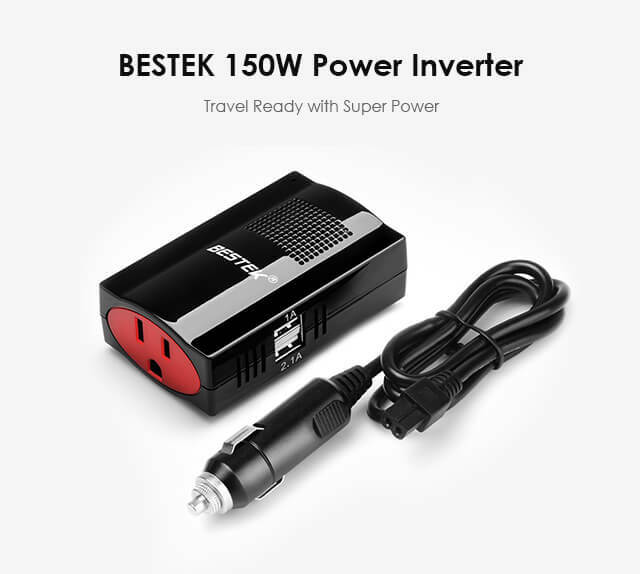 This power BESTEK Power Inverter was exactly what I was looking for. can easily re-charge my Apple iPhone 4s and iPad 2 with the USB chargers. The 2.1A is what the ipad needs for a fast charge. I highly recommend this product as its extremely versatile to fit many needs. I got a wrong power inverter the first time. But the customer service is so nice and they send me the right one at once and told me how to use it correctly. And the charger is also great. 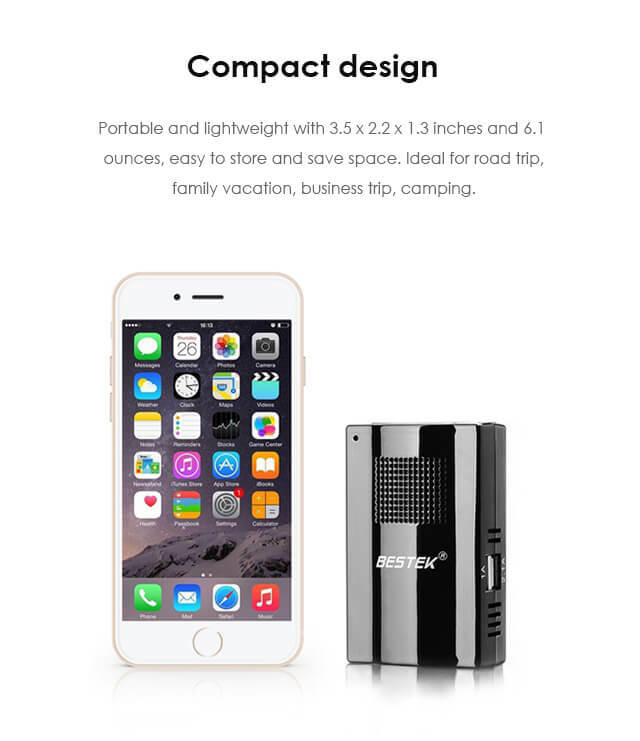 It can charge my cellphones and iPad continuously. Bought it for my new car and it does a great job. Love the USB chargers on the side, too. I used to have a 2-port USB car charger before but it broke down two months later. And I got this inverter to replace it. I think I should have bought it early! I can charge both my cellphone and iPod in the car. And there is no problem so far. I love it. It is my new favorite car charger! Got it last week and tested at once with my phone charger and it worked fine. I am sure it could be used for many other things as well. Happy to have it for my future travel. I use the little inverter to charge the battery for my digital camera in the car when I am on my way to the sites. The USB ports are also good for me to charge iPad and computer. Also very handy to keep in the car. 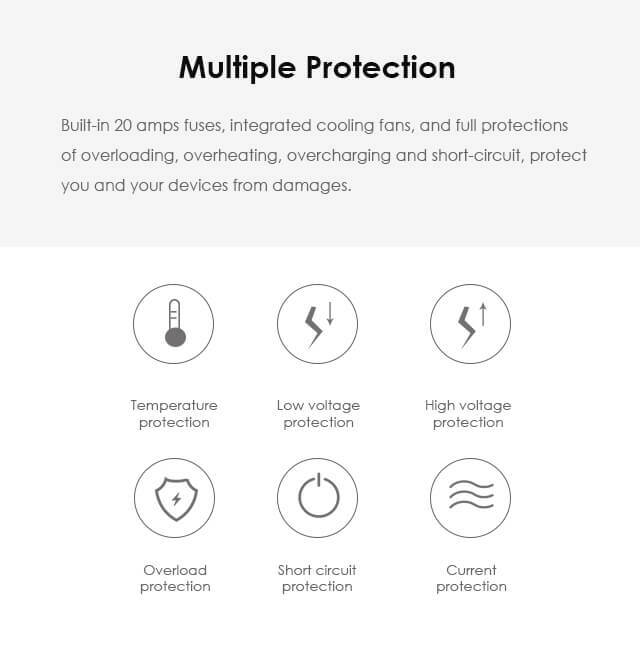 I don't often leave reviews, but this little inverter works awesome. Powers my laptop and charges my two phones without issue. Small, compact, just works. 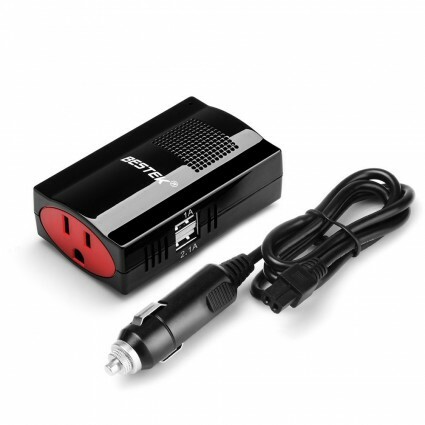 This is a wonderful power inverter! Works perfectly for my phones and laptop. I can use it flexible as it has a rotatable head. So small! I can take and store it without occupying any space.